January 23, 2014 February 10, 2016 ~ Sara W.
So, the question is, are you still working on your New Year’s Resolutions? As we know, from A Bright New Year, mine can’t quite be measured. However, I read a fascinating article today in the January 2014 issue of The Costco Connection magazine. It was highlighting the three parts that create a habit. It made me realize that resolutions are basically either habits we want to start or habits we want to stop. So, I thought I’d try to help with keeping your resolutions going. To break or start a habit, it helps to think about the parts that make up the habit. In Charles Duhigg’s book, The Power of Habit: Why We Do What We Do in Life and Business, he indicates that there are three parts to the habit loop: a cue, a routine, and a reward. For the sake of an example, I will outline the three components of my bad habit. A habit that, sadly, I do not want to stop. I drink one soda a day. It has all the sugar and all the caffeine. I am well aware of the negative affects of this habit. Let’s set that part aside for now though and look at the three parts to the habit loop. My cue is a time of day for me. Cues can be a place, an emotional state, or even the presence of certain people. But my cue is lunch time or shortly thereafter. I enjoy having a soda with my meal. Sometimes I sit down to lunch with a glass of milk or water instead, which pushes my soda cue until after lunch. But the general cue for me is early afternoon. The routine is the habit itself. In my case, drinking the soda. The reward for me is a pick-me-up, the break in monotony of my liquid intake for the day, and the relief from a headache later in the day. Of course, the latter is merely a symptom of withdrawal and would subside after my body adjusted to life without the soda. I know the withdrawals eventually subside, as I have taken myself off of soda a couple times. One time in particular, I did not drink any caffeinated soda for a couple years. I still had a Sprite now and again to spice up the flavor in my life. Living on the edge, I know. According to researcher, Brian Roemmele, the worst part of the withdrawal stage is the first 14 days. Roemmele’s research indicates that if you can make it through the primary withdrawal, those first 14 days, and hold out for an additional 14 days, then most of the work has been done. I imagine this is why we get the standard advice that we can create a habit in 28 days. I remember during my childhood, I wanted to put this to the test. I had heard that if you did something consistently for 28 days, then it would become a natural habit. I decided that I would make my bed 28 days in a row and see if it truly got easier. It must have worked, because I became an avid bed maker. Of course, being a mother to three now, a made bed isn’t always my top priority. I am happy to report though that my bed is more often made than not. And the perk of slipping in under the covers of a made bed at the end of the day is all the reward I need. Now, none of this works if you don’t have a real desire. Hence, me not stopping my soda intake. It just isn’t worth it to me in this point in my life to give up this vice. As a result, I don’t try to kid myself in to doing so. The same goes for weight loss. Once all this child-bearing stuff is done, I would really like to lose some weight. But I already know that I will not forego a cheeseburger for the sake of less pounds on the scale. I love cheeseburgers and a lower number on the scale does not outweigh (pun intended) the reward of a delicious cheeseburger in my eyes. So, I would suggest you be realistic with yourself. Think about what reward is worth the habit. If you’re trying to start a habit that is a drag and seems to have no immediate reward, consider creating a separate reward. For instance, if you want to make sure you are Journaling the Journey but don’t enjoy writing in your journal, give yourself an additional reward for your efforts. Perhaps one journal entry affords you 15 guilt-free minutes to look at goofy YouTube videos? Or maybe you are upset with how personal scripture study keeps getting put on the back burner. In which case, tell yourself you need to read your scriptures for 15 minutes before checking in on your social media outlets. However you work it out, keep in mind that the 28 days to form or break a habit isn’t a guarantee. It might work for bed making and easier habits to come by, but I hardly doubt it works for the person who is trying to quit smoking after years of two packs a day. I’m always leery about studies I find on-line, as they don’t always seem to be credible. But research from 2009 out of the UK indicates that it takes an average of 66 days to form a new habit. And researcher, Roemmele, suggests it takes 45-56 days for your brain cells to deemphasize the emotional need for a particular habit. In other words, count on roughly two months to make or break that habit of yours. Above all, be patient with yourself. If you have a hiccup in your goals, don’t give up and give in. A blogger I read years ago provided one of the best analogies on this matter. If you get a flat tire, you don’t go and poke holes in the three remaining tires. 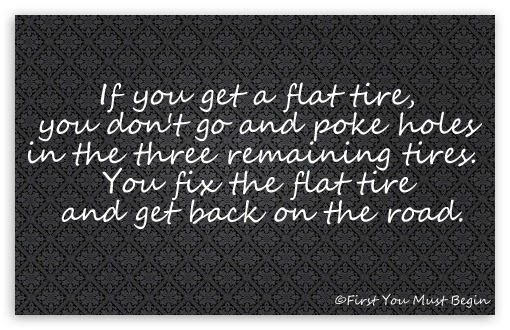 You fix the flat tire and get back on the road. Next > Hiders and Seekers of Joy!